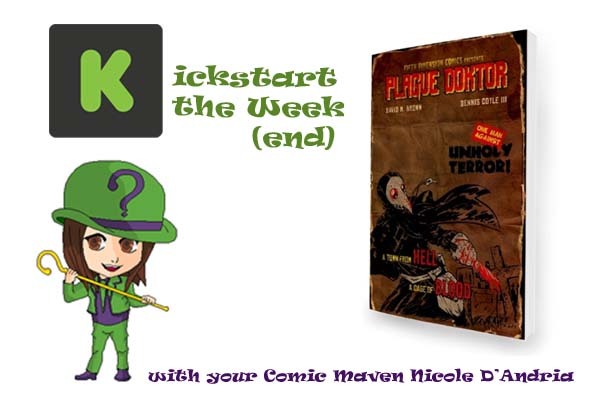 This week we’re showcasing the deluxe edition of Plague Doktor. Be transported to 13th century England during The Black Death. The writer and artist both spoke to me about their inspirations for the series and some unique historical facts. A Plague Doktor enters an infected village and fights a metaphysical battle where the fate of all humanity is at stake. The creators call it “a historical fever dream directed by Satan.” The deluxe edition includes 26 pages of never-before-seen extras including concept art, remarks from the artist, pinups and more. Plague Doktor is written by David M. Brown, the co-founder of Fifth Dimension Comics. He is the writer of Chewler, Obscura and Victor. 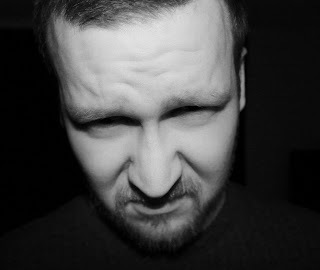 The artist is Dennis Coyle III, who has worked for Pocket Option Games and Green Monkey Comics. The project will be successfully funded if it reaches $2,500 by July 30, 2017 at 1:01 PM EDT. 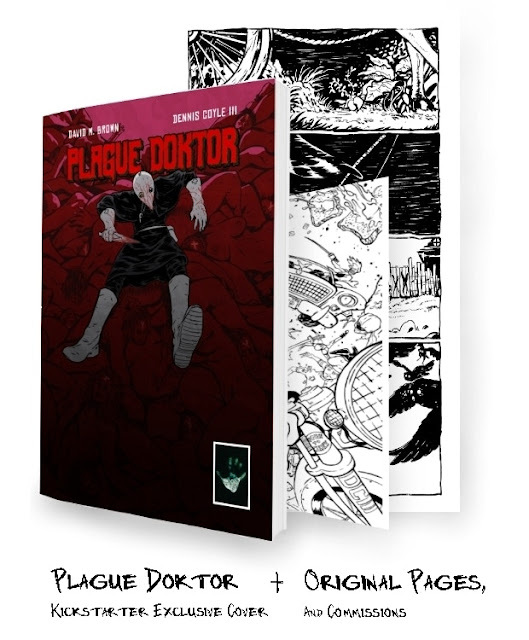 Rewards include the Plague Doktor Digital Deluxe Edition ($7) plus a physical copy ($15), an exclusive full color Plague Doktor print by Dennis Coyle III, an original hand drawn page from Plague Doktor ($55 while pages last!) 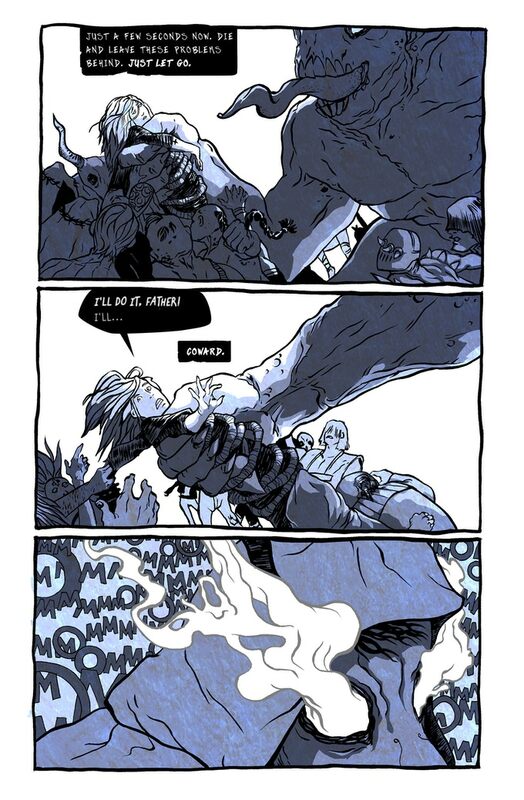 and more that you can see on the official Kickstarter page. Me: What inspired you to take the idea of a plague doctor and make a comic book story out of it? David M. Brown: The first draft of Plague Doktor was actually completed six years ago so the details of the initial idea are a bit fuzzy. I do recall a couple things about where my head was (still is) at though. Firstly, I have always been taken with the thought of what it must have been like to live through a plague. I don't think our modern minds could really deal with such a thing, so to put myself in the shoes of someone who was waist deep in such a terrible event was interesting to me. Secondly, the environment of the Black Plague allowed for some really interesting setting and atmosphere. Thirdly, Plague Doktors are such iconic figures and have such a unique look that I knew the story would be visually interesting. Me: What kind of research did you do into the 13th century and what are some of the most interesting facts you found and used in Plague Doktor? Brown: Although I did read a couple books on the Black Death specifically, I cheated a bit. I researched as many plagues and outbreaks as possible and used what I liked from them. I looked at as many paintings from the period as possible to try to get the right feel. While not specific to the 13th century, the 'X' on the foreheads of the plague victims and on the gates of infected towns gave me a nice creepy vibe that I ran with. I also read that a good number of people who became Plague Doktors actually did it to rob the corpses. I had to use that! Me: You mention researching many plagues and outbreaks. Which of these did you find the most fascinating to study and why? Brown: Far and away, The Black Death was most fascinating to me. The sheer volume of destruction it caused is absolutely mind blowing. It killed somewhere around 75 million people worldwide. Imagine if that happened today. It completely changed the world at the time. That's what I find most interesting. Lots of different plagues had major ramifications, like the Plague of Justinian and The Third Plague, which killed 12 million people. To me though, The Black Death was on another level altogether. Me: How would you describe the personality of the Doktor and some of the supporting characters or antagonists in the book? Brown: Nils is our main character. 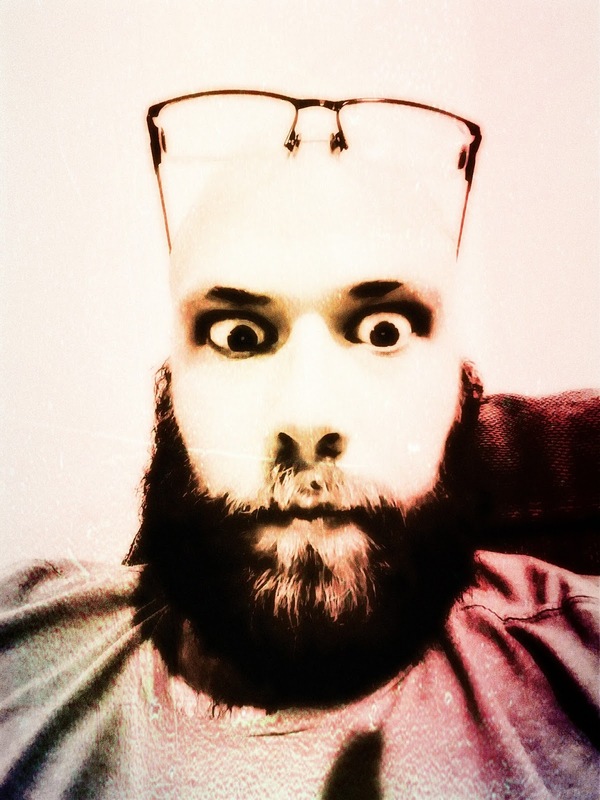 He's an interesting one. He is a social outcast and has only ever really had one relationship with another human being... his mother. His entire motivation for doing what he does is tied in with her eventual fate and the unseen guiding hand of his father, whom he never knew. “The Adversary” is our villain. It's difficult to not get into spoilers when talking about him, but let’s just say his true identity is one of the most famous characters in human history and he has a very tiring job. Me: So what does Nils typical day on the job look like? Brown: A typical day for Nils is a very sad affair. He must travel from village to village knowing full well that he can do nothing to help the victims of The Plague besides offering comforting words and/or light medical treatment. Imagine traveling across the country, entering these plague towns and the best you can do for the suffering people is lance their swollen lymph nodes? The worst part though, as we show in the book, is when a parent and a child both have the disease. The parent obviously wants you to do all you can to help the child and all the while, you know that nothing can be done. Nils has to live with this kind of thing every day and is haunted by it. Me: Are there any plans for future stories in this universe that you can share with us? Brown: Given how the tale ends, there is definitely room for a sequel (or prequel) but we are taking one thing at a time at the moment. Never say never though. Me: What is the number one reason you think people should pledge money to your Kickstarter? Brown: The number one reason people should support this book is a simple one. Originality. There are no stereotypes here, no superheroes, no predictable cookie cutter plot lines. We have enough of those types of comics. Help us bring something new and fresh into the world! Me: What inspired you to help found 5th Dimension Comics and what would you say is the publisher’s mission statement? Brown: My advice for anyone thinking about writing comics is to just do it and for the love of God, be original! We have enough Supermans and Batmans in the world. Bring something fresh to the table and readers will respond. Me: What kind of research did you do to make the book look like it took place in 13th century England? Dennis Coyle III: When I first read the script it was ambiguous as to the location, Europe it said, so I just went with that. The time period is set shortly after the conception of gothic style so I attempted to incorporate those elements when I could. I had a corkboard wall overflowing with the design principals behind gothic archways and windows, reproduction images of armor and clothing from all walks of life, and from various countries throughout Europe. One of my favorite diagrams was that of hairstyles from the century. A lot of research I did never shows up in the book, such as a variety of occupations, decor design, and the commune of Eguisheim on which I based a lot of my town design. Me: What was it that made the hairstyles one of your favorite diagrams? Coyle: The hair diagrams were some of my favorites because of the lace, ribbon, and/or netting tightly woven into or around the hair itself. Lots of buns, braids and headwear. Very interesting from a fashion design point of view. Me: How would you describe the art style you used for this story? Coyle: It's a flurry of manic brush strokes dipped in an ice bath. 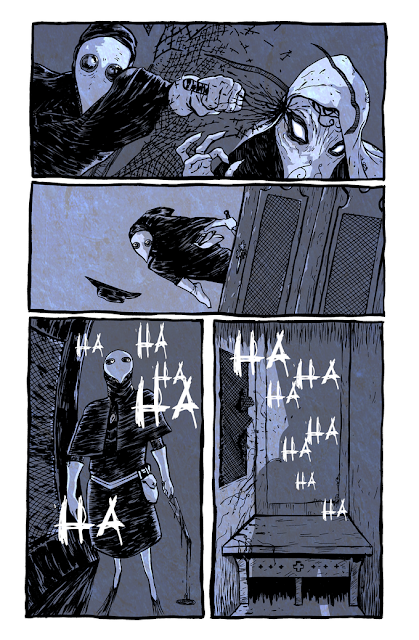 Me: What was your favorite page to draw in Plague Doktor and why? Coyle: I have a few favorite pages, but I would have to say that the arrival of our beloved Doktor to town is my favorite. It's where I first tested out inking for the book and found my approach for the project. 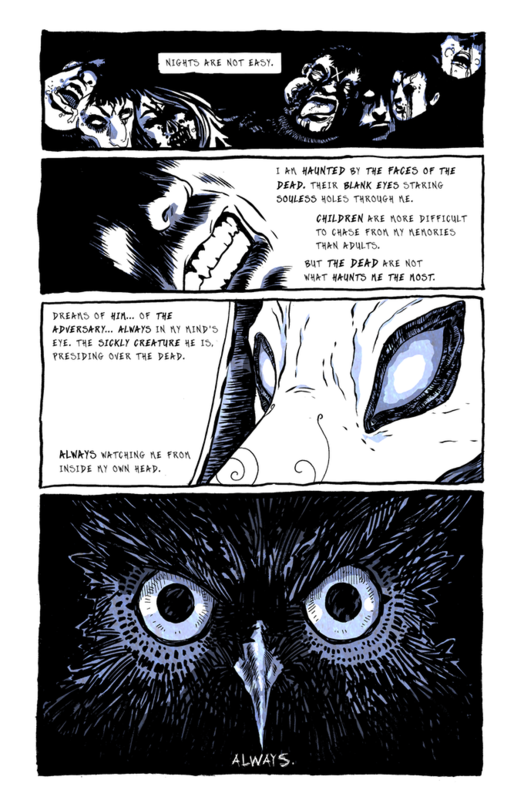 And it kinda reminds me of Vampire Hunter D.
Me: Part of the extra material in the deluxe edition includes “remarks from the artist.” Can you tell us a bit about what this is and some of the other extra material readers can find in the deluxe edition? Coyle: David and I have spent about five years on this project off and on with multiple restarts and revisions. The extra material includes sketches, early and alternate character designs and some side notes about the process and my time on the project. Me: You mention that you and David both worked on the project off and on for about five years. Why did the process take so long? Coyle: Plague Doktor took an age because of a variety of life changes, good and bad. I also really didn't know what I was doing when I got started, only having a couple shorts under my belt. 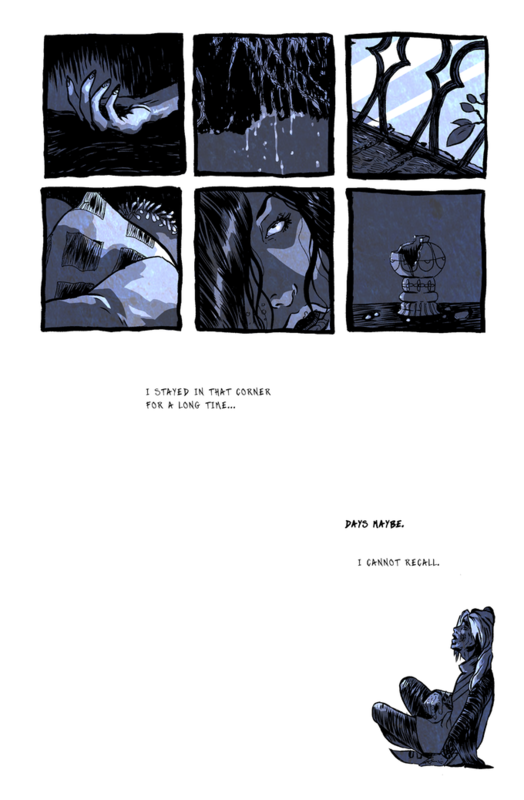 I spent quite a bit of that time in project limbo studying the medium and trying to find out how I wanted to approach the story. Once I was ready it only took a few solid months to hammer it out. Me: Since you also mentioned that the project went through some “restarts” and “revisions,” can you tell us a bit about how previous versions differed from the final product? Coyle: The original style was very dry brush heavy and I was pushing for a heavy metal look. I wanted something much more painterly, like Requiem. I ran into some issues with that and eventually switched to charcoal and pencil. David said it had a storybook feel. Then came another long hiatus. When I returned to the book I developed what you see now. 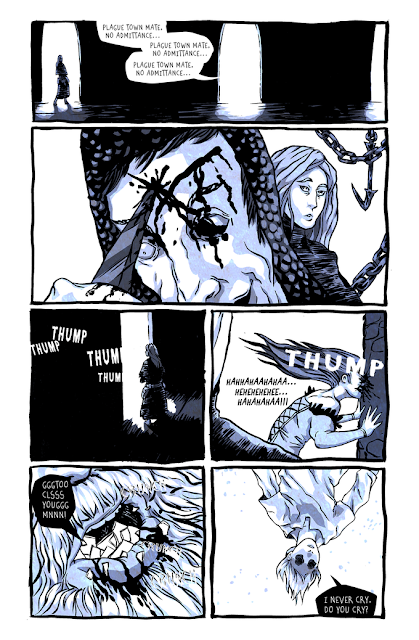 Partly it was to keep a quick pace and partly it was being inspired by brush inkers along the way. Coyle: We have a good story, some added grindhouse flair, and a lot of love poured into it. Coyle: Don't aim for perfect. Don't even aim for good. Aim for done. Done is better than perfect. Me: Thanks for your time David and Dennis! If you’re interested in learning more about their Plague Doktor Kickstarter, see the official page.